My mom's flying in today for her first visit ever to New York. Since there'll be a foot of snow, and my press car doesn't have snow tires, she'll have to take a taxi. Here's the note I sent her. From baggage claim, there will be a sign pointing out where to get taxis, they'll direct you to a long line of people. Make sure you get in a YELLOW taxi. There will also be a bunch of men in leather jackets asking if you need a taxi. DO NOT accept offers of taxi rides from any of these men or anyone else. Yellow taxi = good. Black taxi or anything else = bad. At the front of the taxi line there will be someone in charge. This person's job is to ask you where you are going, but to do nothing else. Just tell them "Carroll Gardens," it doesn't matter if they understand you. I suggest you carry your luggage with you in the back seat as the trunks in taxis tend to be full of empty gas and oil cans, flammable rags, road flares and quite possibly the driver's wardrobe. You will need to load the luggage yourself as the driver will not help you. Once you are in the taxi, you will need to tell the driver where you are going. [Redacted] in Carroll Gardens, Brooklyn. The cross street is [Redacted]. There is also a neighborhood in Queens known as "Kew Gardens" many taxi drivers don't understand English very well, so you need to make sure they understand that you're going to "Carroll Gardens, in Brooklyn." Careful enunciation is crucial. At this point, the on board entertainment system will begin blaring inane infotainment. Be careful not to switch it off, as this can mess up the credit card payment system for later. Instead, set the volume to mute. Now things get interesting. 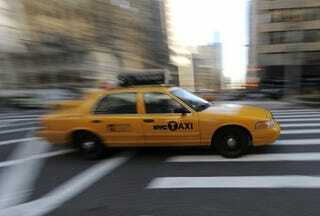 Taxi drivers in NY don't know where things are, so they need directions from their passengers. Take the Van Wyck Expressway to 495 West. Then take the Brooklyn Queens Expressway (AKA "BQE") west (it actually goes south) to the Atlantic Avenue exit. This comes quickly after you pass underneath the Brooklyn Bridge and your driver will be tailgating someone in the far left lane, so ask him to move to the right and remind him the Atlantic Avenue exit is next. Make the first left onto Congress. This arrives very quickly, so make sure the driver knows to turn. Go 2 blocks then turn right on Henry Street. Ask the driver to stop on the block between [Redacted and [Redacted]. We are on the left hand side. If you remembered to set the entertainment screen to mute instead of off you'll now be able to pay by credit card. After you've done so you'll need to wait for the cabbie to print your receipt using his ridiculously slow printer. During this time a line of traffic will form behind the cab and blare their horns, don't worry, they're not honking at you. You sign this receipt at the top, then you're free to go. Tip: one in a hundred drivers will actually know their way around. After I initially give the driver my destination, I ask if they know where they are going. If they appear confident when they say "yes" then you can sit back and relax. Don't be tricked into conversation with the ubiquitous "Where are you from?" gambit. That's just an excuse for the taxi driver to tell you about his life as a 55-year old recovering drug addict who just got kicked out his shared basement apartment and now lives out of his cab. You really don't want to know this information. If they start talking to you just pretend you think they're on the phone. They probably are. This is an actual email I sent my mom. Why does taking a cab in New York need to be this complicated?